The ATPR powder is useful in situations where you need a visible stain detection. 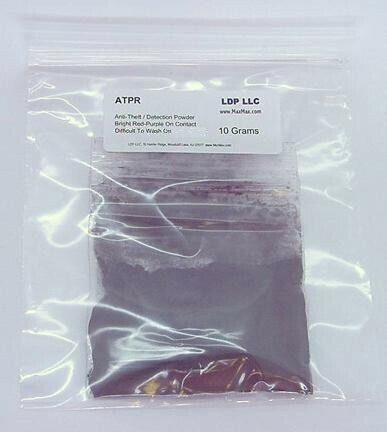 The ATPR powder normally has a dark green / brown appearance. However, once the powder becomes moist from the moisture in skin, water, alcohol, acetone or just about any liquid substance, the powder changes to a highly visible purple stain. The stain is very difficult to get remove. 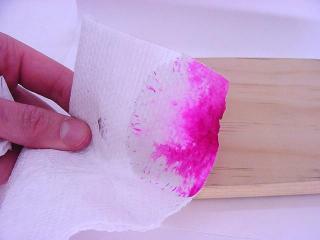 Water, alcohol, acetone and other solvents do not remove the stain. Depending on how long somebody washes a stain, how much staining occurred and the type of soap or cleaner used, you can expect the stain to last 1 to 3 days on skin. On something like white carpeting, the stain will likely be permanent. The ATPR powder can be extremely messy, so be very careful in using it. Very slight specks that are near invisible to the eye will turn violent purple on contact with water. 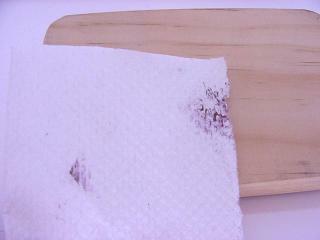 Be careful about the items you mark since it will be difficult to remove the powder without staining the item. Let's just repeat the messy part again. Seriously, this stuff can make a big mess in tiny quantities in the time you can blink. Before you open it, think about the results. ATPR has similar properties for Food Red 15 which has been found to have carcinogenic effects for large doses or long periods of time. Therefore, we don't recommend long term repeated exposure. A less messy alternative is to use our UVXPBR highly fluorescent powder. Because the powder is so highly fluorescent, trace invisible amounts can be seen under UV / black light. Since the powder has a normally light beige appearance in quantity, clean-up is less problematic than our visual staining anti-theft powder ATPR.